The major US indices closed mixed on Friday. The Dow was the best performer, gaining 0.49%, while the S&P 500 was up 0.19% and the tech-heavy Nasdaq fell 0.26%. The small-to-mid cap and more domestically focused Russell 2000 index declined 0.20%, while the Dow Transports slipped 0.50%. Most of the major S&P 500 sectors closed higher. Energy led the way north, while materials, real estate and consumer staples also made solid gains. Financials were the laggards and closed modestly lower. Among industry groups, energy-linked stocks fared best, followed by brewers and mobile telecommunications. Clothing, airlines and autos fell. Exxon Mobil shares advanced 2.1% as the sector tracked oil prices higher on the OPEC agreement to increase production by less than the expected amount. Used car retailer CarMax surged 12.9% after topping revenue and earnings expectations for the quarter. General Electric (+2.3%) is being dropped from the 30-stock Dow Jones Industrial Average Index for the first time in over a century, with Walgreens taking its place. 21st Century Fox shares ticked up 0.6% on Friday to cap off a strong week, gaining 8.5% after Disney topped Comcast’s bid to buy most of its media assets. In Hong Kong, lens maker Sunny Optical gained 2% as investors looked to snap it up on the cheap after a significant decline on no news on Thursday. The Macau casino operators such as Sands China, MGM China and Wynn Macau made modest 0.2% to 1.6% advances as visitor statistics data for the month of May was released. The pace of the market today is more likely to be set by the resource sector, with a surge in the oil price on Friday seeing the Northern Hemisphere listings of BHP and Rio well bid. The SPI futures are pointing towards a 10-point gain on the open. Domestically, this week is a very light one data wise, and with the typical ‘squaring up’ ahead of the end of the financial year, offshore factors will likely dictate direction. Visitors to Macau totalled a little over 2.7 million in May, up 5.2% from a year earlier. Mainland Chinese arrivals, which are the largest visitor group by far, were up 9.3% year-on-year. Sequentially though visitor arrivals were down and this is likely a core factor in the moderation in casino gross gaming revenue (GGR) in May. Data from the Gaming Inspection and Coordination Bureau of Macau showed casino gaming revenue in the world’s largest gambling hub increased 12.1% year-on-year in May to 25.49 billion patacas, equating to about US$3.1 billion. Although a double-digit increase is nothing to be ashamed of, that represented a cooling of the pace of increases seen earlier in the year and was well below the 27.6% year-on-year increase seen in the month of April. The May increase also missed the 16% to 20% growth range expected by analysts. An adverse (for the casinos) VIP ‘luck’ factor played a key role in the slower pace of growth for May. Although May revenues fell short of expectations for the sector, the month nonetheless marked 22 straight months of year-on-year revenue increases. Year-to-date cumulative revenue growth in Macau for the sector is still impressive at 20.1% to 127.7 billion patacas (US$15.96 billion). The medium to long-term outlook is also solid in our view due to a combination of the region’s growing range of world-class attractions, proximity to China and rising incomes in Mainland China acting as a tailwind for outward bound tourism. 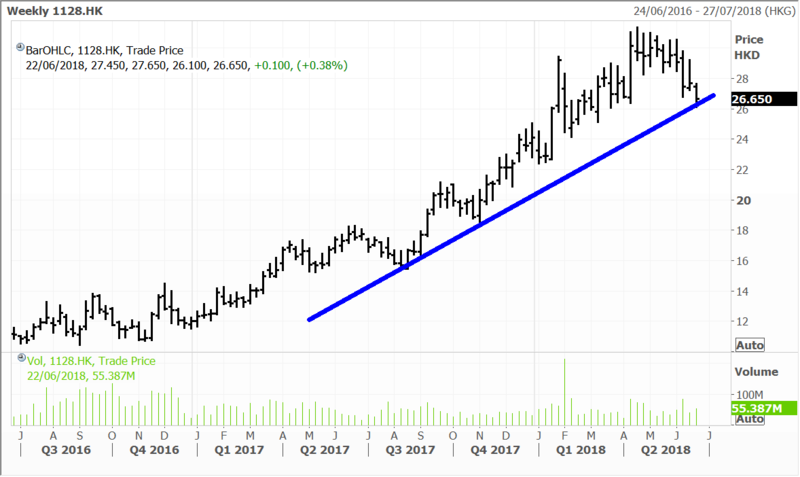 Wynn Macau remains in longer term uptrend, despite a recent pause. The Macau gaming stocks typically underperform for a few months at this time of year, with momentum likely to return in the second half. Chinese search engine operator, Baidu Inc announced on Thursday that it was testing its two self-driving cars on an unused expressway in north China’s Tianjin City. According to the company it was the first time Baidu driverless cars were tested on an expressway. Senior engineer with the road test team, Wang Xiaolong said the trail run enabled the developers to collect data points on the cars’ performance in positioning, self-control and sensing the environment. The 33km section that was used in the test is part of the Tangshan-Langfang expressway that is scheduled to open later this year. Baidu is in a race with Google and other companies to bring self-driving cars to the market. The company is relying on its Apollo platform to apply its strengths in artificial intelligence (AI) to build a self-driving vehicle and ecosystem. Recently the company announced a big upgrade to its open source “Apollo 2.0” platform to speed up progress of autonomous vehicles. 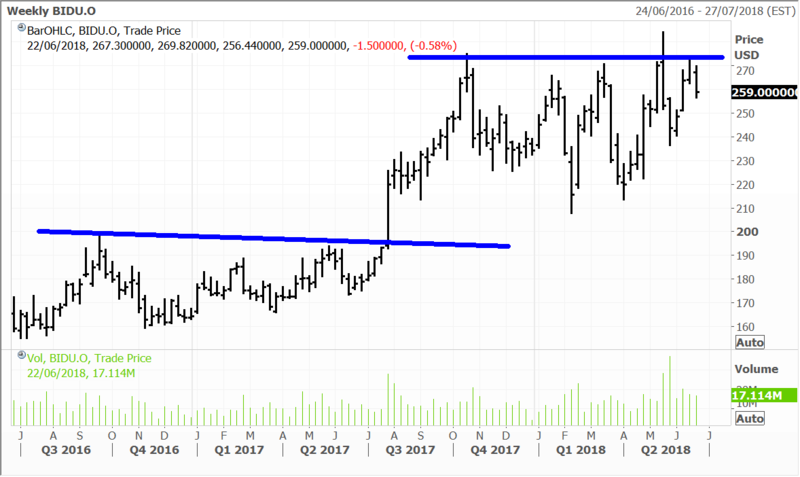 Baidu has consolidated nicely below $280 after a succession of higher reaction lows during recent corrective selloffs. A topside break now seems to be only a matter of time. Walt Disney’s offer to buy 21st Century Fox assets for US$71.3 billion in cash and stock has been accepted by the Fox board. The offer from the company topped the Comcast all cash offer of US$65 billion. The new deal will see Disney pay $38 per share for Fox assets – an increase of 36% over the offer that was accepted in December last year for $28 per share. Disney CEO Bob Iger said that there were higher valuations for the entertainment assets and that US President Trump’s tax changes justified the higher offer as they will lead to lower corporate taxes in coming years. There are still some analysts that expect Comcast to make a counter offer, but at the moment the big winners are the Murdoch’s and Fox shareholders. Murdoch was accused of favouring the initial Disney stock deal to avoid taxes on the cash deal from Comcast. The new Disney deal with cash and stock would seem to avoid a conflict-of-interest for the Murdoch family over taxes as shareholders could choose cash or stock. Both Disney and Comcast are looking to expand globally and ramp up Hollywood studios and franchises like “X-men” and “The Simpsons” to better compete with fast growing digital rivals Netflix and Amazon Prime. Mr Iger said that there were no plans to divide up the Fox assets between Disney and Comcast. In other news relating to the matter, Disney said on Thursday that it was willing to divest 21st Century Fox assets that generated up to US$1 billion in earnings before interest, tax, depreciation and amortization (EBITDA) to get the regulatory approval for the deal. The company said in a regulatory filing that it was willing to divest the assets including regional sports networks. 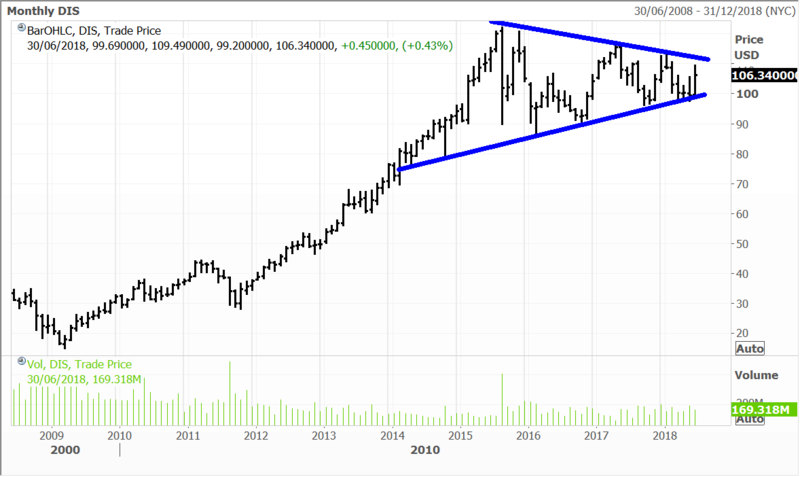 Disney continues to converge within a triangle trading range. A breakout is going to occur at some point, and we are of the view this will be to the topside. Winning Fox in a takeover could prove to be the catalyst. Disclosure: The Fat Prophets Global Contrarian Fund declares a holding in: Disney, BHP, Sunny Optical, Sands China, MGM China, Wynn Macau and Baidu.